I’ve thought about writing about this for a long time…. But I was never really sure how to most effectively write something like this without becoming a rambling mess… Well, I’m now going to try…. 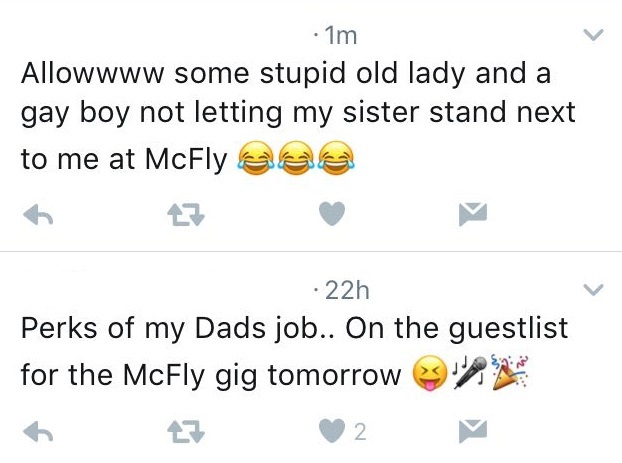 A Friend of mine (@JadeSanders) offered me a ticket to McFly. I literally felt like I was about 12 again! We were quite early and quite close to the front…. We got into a slight altercation with a young lady whom thought she owned the 02 Forum. She was rather angry with myself, my friend and the people around us who wouldn’t let her and her sister push all the way to the front, especially as they strolled in about 10 minutes before the start, bragging how “Daddy got us free tickets”… And we’d been there for over an hour. “GayBoy” wasn’t really trending at that moment! Being the only male (not attached to a girlfriend) in the vicinity at the time, stood with the girl in front’s mum, I think we are pretty safe to assume it was about us. Firstly the lady was NOT that old. 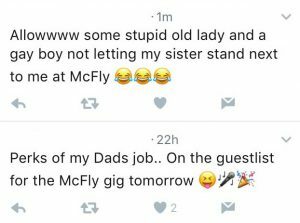 She was actually very funny, and didn’t really care for McFly, but cared for her principles and was not gonna let them past. Then the part about me. Not only is it a touch Homophobic, but also factually incorrect… And I’m a little bit fed up. Nowadays, it seems that one can’t appreciate the theatre or cheesy music (McFly being from my childhood!!!) or be a little camp, without constantly being branded “gay”. I sing in a choir, Play a huge variety of instruments and Am a pretty sensitive person…. But I also drive a moderately fast ride, love going to theme parks and often find myself standing shouting profanities at a football match. That’s my personality, my musical preferences, my life choices and it has NOTHING to do with my sexuality. It is crazy to think that not that many years ago, should you have wanted to find yourself a girl, you went to a dance. You weren’t dancing like we go clubbing nowadays, but you’d have to summon up the courage to ask the lady you desired to a ballroom dance. Should you even suggest that you might do a samba or a tango now days, you’d also be instantly branded “gay” by a huge number of people. On one hand, it’s a pretty awkward question and you should be minding your own business… But on the other hand, WHAT DIFFERENCE. Get to know me a bit more and you will probably be able to work it out! (Clue; I used to be a regular buyer of nuts magazine – not for the articles and was distraught when it was discontinued! 😉 ). I am thankfully ok with answering such questions. I know how I feel and no one is gonna change that. That’s not how the world works. If you keep calling a dog “Cat” it doesn’t become one. However, I feel for those who might not be so prepared. I feel for the kids at school who constantly get the bullied for “being gay” when they’re not. At the end of the day, no one is going to change me; if we were only how other people wanted to see us, then the world would be a weird place. Meanwhile… I’m going to go back to my tube ride to work. I’ll shuffle the iPod and see what I’ve got. Could be Welsh Rock band Manic Street preachers, or could be Spice girls. Who knows. Who cares. I’m gonna sit here smiling to myself regardless, happily knowing the fact that what other people think ain’t gonna change a damn thing. Clicks fingers, drops mic and walks away. SteveeyP, Over and… Well… In I suppose. I moved Primary school in February year 5. Those four things are all that spring to mind. Without deep thought, nothing easily comes back to me about my time at Primary school. Everything else before that February in Year 5 has been covered with a huge mental plaster, stopping me from thinking back to those years…. I was bullied at primary school. Physically, Verbally, and mentally….. The bullying was so bad, that I had to move schools….. Reception til year 2 was a separate school at my Primary school, those are years I can remember. The computer going up in smoke, Meeting Caroline from Germany, Lessons in year 2 in the hut at the back of the building…. Then we changed to the Junior school (literally the other side of the fence!) for year 3-6 (well, 3- 5). I remember bits of year 3, Miss Conder, Reading a bit of Harry Potter (I think)… But then it began…. I remember a class project – to have a photo taken with your friends. This was to be put in a frame as a memento….. I remember turning up in the playground, with no one to have a photo with. No one wanted me. I was shoved in a photo with two girls who were best friends. I remember the photo (which I think I threw away) had me pulling the Fakest smile. While deep inside I was so unhappy. But then year 4…. I don’t remember much of year 4…. not much at all……. I’m not sure how it started. The bullying slowly crept its way into my life… when I think back, I remember struggling in Year 4 to finish my DT project, because every time we had a DT lesson, more of my Project was broken than I’d fixed in the previous lesson…. at the time it seemed mere coincidence…..
Toward the end of year 4, things took a turn for the worse. The name calling started. I know it started, but my memories are so vague… I blocked them out years ago, not wanting them to haunt me for the rest of my life. I remember “Stupid”, “Jew”, “Idiot”, “High Pitched”, “Girl Voice”…. It’s amazing how spiteful 8 and 9 year old kids can be. I’m not entirely sure when it got physical. Every-time I drive past the school and I see the green fencing, even to this day, I go cold and shiver a little. I remember a number of times, Being held up against the fence. It’s oblong gaps providing slight refuge to my back being pressed against it’s metal bars. I remember what seems like hundreds of faces, yet were probably maximum 3, Crowding round me. I remember the kicking, the punching, the name calling, the taunting. 3 or 4 against 1. Writing this is making memories flow back that would never have come to me normally because they are usually blocked out. I remember in year 5, we had to make a drink… Design the label… and make a radio advert…. I had a Jingle, I had a word art label…. and I had a bottle full of Blackcurrant juice and vinegar….. “Dooberry Ding”. By the second day, the bottle was empty, under the table. The issue was deep routed. Routed within someone whom I thought was a friend. Who at first I trusted as my naive 8-10 year old self. The main culprit was someone who, on a Monday night, I’d go home with, we’d go to Tutor together, and then his mum would drop me home. He was the one, making my life at school hell. The order of the events is blurry…. The mind can play wonders at trying to help you forget. I remember I was “Computer monitor”. It was my job to turn the computer on in the morning when I got into the classroom. One day I noticed, the computer was already on when I got into the classroom… That night, at the end of school, I turned the computer off, flicked off the plug socket and left. The next morning I get to the classroom, and the computer is back on. The teacher told him not to, and he carried on. As time went by, things got worse… Pencils thrown across the classroom. More physical bullying in the playground…. I hear you cry “Where were the teachers?”… Well……. I was told, that because I was kicking my way out of being held against the fence, I was equally in the blame… The cold words of the teacher resonate in my head… “People in glass houses, shouldn’t throw stones”…. and for the Verbal abuse, I was to “Grow Broader shoulders” and Ignore them. Writing this, I’ve gone cold. Ice cold. I’m shivering just thinking about it. Bullying does crazy things to you. While I came home from school every day, sad, cold and depressed, I also didn’t want to leave the school. My legs was bruised, my soul was beaten down, and my once happy smile was gone. Yet in a way, I didn’t want to leave what I already knew. Eventually I was lucky. A place became available at a school one of my friends moved to in year 1. Reluctantly I woke up early one Friday morning to go and see the new school. As soon as I walked through the door, my mind was made up. In what seems now, like a “goodbye sequence” only available to characters in EastEnders, we left the new school, arrived at the old one, told the head teacher I wasn’t coming back… had an afternoon of lessons, and left my mental and physical hell. I remember crying at break time as I went to tell one of the other class teachers that I was leaving… I LOVED her lessons – possibly once a week (I don’t remember) we were split into abilities, and that lesson, was to me rest-bite. Away from the people who caused me hell and harm….. I do not count the time after that February half term in year 5 as primary school. That year and a half contains enough AMAZING memories to make up for the years I blank out. I don’t talk about the time before it simply because I don’t like to think about it. Each time I think, it’s like ripping that plaster off the wound. Changing the metaphorical dressing in my mind. I also don’t talk about it, because people consider it as a sort of “Sob Story”. I don’t need a Sob story. I’m better than the bullies. They stopped me when I was younger, they inhibited my life for a few years. I’m free of them. I don’t need them casting a legacy over me. I don’t need to use their behaviour to grant me merit. I am my own person, and their words, their games, and their violence is not going to stop me any-more.